Illuminating the dark side of economic globalization, this book gives a rare insider's view of the migrant farmworkers' binational circuit that stretches from the west central Mexico countryside to central California. 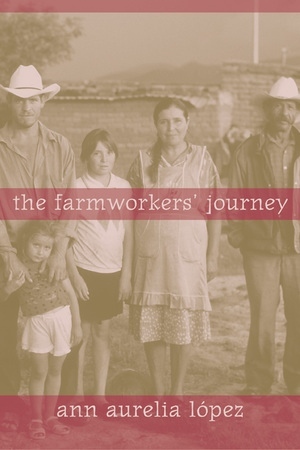 Over the course of ten years, Ann Aurelia López conducted a series of intimate interviews with farmworkers and their families along the migrant circuit. She deftly weaves their voices together with up-to-date research to portray a world hidden from most Americans—a world of inescapable poverty that has worsened considerably since NAFTA was implemented in 1994. In fact, today it has become nearly impossible for rural communities in Mexico to continue to farm the land sustainably, leaving few survival options except the perilous border crossing to the United States. The Farmworkers' Journey brings together for the first time the many facets of this issue into a comprehensive and accessible narrative: how corporate agribusiness operates, how binational institutions and laws promote the subjugation of Mexican farmworkers, how migration affects family life, how genetically modified corn strains pouring into Mexico from the United States are affecting farmers, how migrants face exploitation from employers, and more. A must-read for all Americans, The Farmworkers' Journey traces the human consequences of our policy decisions. Ann Aurelia López received a Ph.D. from the University of California, Santa Cruz. She recently completed a President's Postdoctoral fellowship at the University of California, Berkeley. She has a long history of teaching Environmental Science, Ecology and Botany courses in the Department of Biology at San Jose City College. She is currently a Research Associate at the Center for Agroecology and Sustainable Food Systems at the University of California, Santa Cruz, and is in the process of establishing a non-profit organization designed to improve the lives of California farmworkers and their families in Mexico.